The January issue of INSOR’s monthly analytical bulletin has been published. The main topics of this issue are: US foreign policy; the situation in Syria; soft power and public-private partnership; the Magnitsky Act; Afghanistan ahead of the ISAF withdrawal; and, the prospects for the Chinese economy. 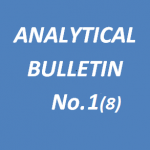 The annotation of Analytical Bulletin No.1 (8) can be found below. The full text of the bulletin in Russian can be found here.